South African Peach And Thyme Filo Tarte Tatin. Today I am sharing a recipe created by Nicola Millbank (using South African peaches, available in UK supermarkets until the end of April). The flavour and quality of peaches from South Africa is exceptional due to the country’s sunshine, ideal climate and near perfect growing conditions. South African fruit is also an ethical choice because of its role in developing the country in the last 20 years. 2. In a 20cm ovenproof frying pan, heat the butter and sugar over a medium heat without stirring until it becomes like caramel. 3. Lay the sprigs of thyme down in the caramel and top with the peach slices. Cook for a couple of minutes until softened the remove from the heat. 4. Lay down a sheet of filo onto the work surface, brush with melted butter and lay another on top, repeat this process with all 6 sheets and then lay on top of the pan, carefully tucking the pastry into the pan to create a snug lid. Brush with a little butter and pop into the oven for 15-20 minutes or until golden brown. 5. To serve, carefully place a plate on top of the pan and in one swift movement turn it upside down. 6. Serve the tarte tatin whole for everyone to dig in with some good quality vanilla ice cream. The sheltered valleys between mountains in the Western Cape are ideal for the cultivation of fruit such as plums, peaches and nectarines. High in fibre – An excellent source of vitamin A and C – Low in fat, calories, cholesterol and sodium – High in carotene and potassium. 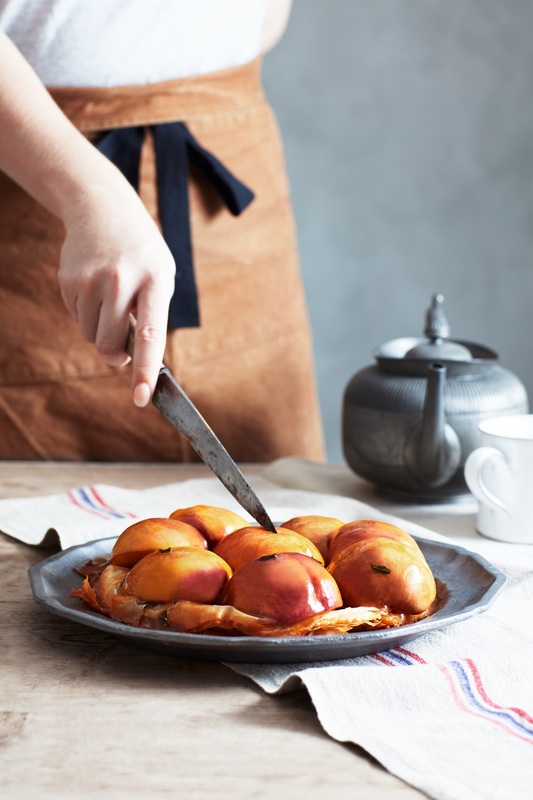 What do you think of this South African Peach And Thyme Filo Tarte Tatin recipe? How To Make A Nice And Healthy Feta and Grilled Peach Salad With Toasted Seed. "15: The Wednesday Link Up: Link Up Your Posts Today"